Crowley County Correctional Facility is located in Olney Springs Colorado. 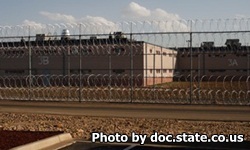 It is a private facility that has been contracted through the Colorado Department of Corrections to house inmates. It currently can house close to 1600 inmates in over ten different buildings. Education opportunities at this institution include adult basic education and GED courses. Inmates can also learn a variety of vocational skills including woodworking, computers, electronics, janitorial, and gardening/horticulture. These skills can become useful when the inmate is eventually released back into society. Once your visitors application is approved you may visit on Fridays, Saturdays and Sundays from 8:30am-3:30pm. Visitors do not need to schedule appointments. Visiting may occur twice per week. Visits are two hours in duration.